Comprising only the walls, portico, and grounds of the onetime 19th century girls boarding school, the "ruins" offer porches for public street scenes, the remains of the kitchen for Capulet's orchard, the remains of a cellar for the crypt, lawns for sword fighting, and a window for "yonder window." 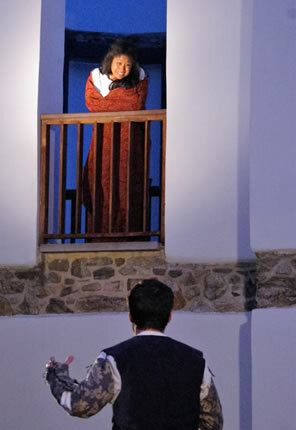 Romeo (Séamus Miller) converses with Juliet (Elana Michelle) in Chesapeake Shakespeare Company's movable production of William Shakespeare's Romeo and Juliet at the ruins of the 19th century Patapsco Female Institute. Photo courtesy of the Chesapeake Shakespeare Company. Romeo dismisses Benvolio's suggestion out of hand. Nobody, he argues, has gazed upon as perfect a woman as Romeo has gazing upon Capulet's fair niece Rosaline. "Forget to think of her," Benvolio advises, "…By giving liberty unto thine eyes; examine other beauties." Romeo approaches one such beauty standing in a crowd nearby, puts his arm around her, and argues it's no use. "Show me a mistress that is passing fair," he says, offering the woman as example; "what doth her beauty serve, but as a note where I may read who pass'd that passing fair?" After a beat he turns to the woman. "Sorry," he says off-handedly, not intending to be rude, just Romeo being Romeo. This particular Romeo is played by Séamus Miller, and the object of his backhanded compliment is a member of the audience. Working within an audience as opposed to merely working an audience is a tried-and-true device for enhancing performances. Interestingly, William Shakespeare's texts seems more pliable to such audience interactions than those of many subsequent playwrights, suggesting that he was writing for such purposes in the environments where his plays were staged, whether in the public theaters of his Elizabethan era, in manor halls or royal chambers, or in the marketplaces and inns that touring troupes used for play spaces. At its summer home, the Patapsco Female Institute Historic Park, the Chesapeake Shakespeare Company (CSC) often takes Shakespeare's theatrical environment a step further—actually, many steps, as trod by actors and audience—with its "movable" productions, shifting scenes from site to site around the grounds. This style of playing is not unique to CSC: several companies have staged productions with both pastoral and urban landscapes, it's the sole mode of presentation for the New York Classical Theatre, and Chicago Shakespeare Theater is even using digital technology to lead audiences through a citywide play space. While such productions usually provide a fresh aspect for engaging with Shakespeare's plays, their individual successes come down to three qualities: textual interpretation, cast performances (both true of all theater), and logistical efficiency (specific to movable theater). CSC's Romeo and Juliet scores both high and low on all three fronts. Patapsco is an appealing setting for a movable production of Romeo and Juliet. Comprising only the walls, portico, and grounds of the onetime 19th century girls boarding school, the "ruins" offer porches for public street scenes, the remains of the kitchen for Capulet's orchard, the remains of a cellar for the crypt, lawns for sword fighting, and a window for "yonder window." With characters in traditional Renaissance costumes by Designer Kristina Lambdin, co-Directors Scott Alan Small (who also plays Friar Laurence) and Katie Keddell not only pick locales suitable for each scene, they manage the transitions to minimize audience movement. A large tent erected on one side of the ruins serves as the Capulets' mansion while an adjacent terrace serves as Friar Laurence's cell and a hangout for Romeo, Benvolio, and Mercutio. As scenes switch from one to the other, the majority of spectators merely shift their gaze while others casually stroll the few steps from one view to the other. The directors' lone misstep comes, crucially, in placing the final scene in the cellar. After the scenes of Juliet's faux death in the tent and Romeo's visit to the apothecary next door, we move into the kitchen space for the quick scene of Friar John telling Friar Laurence how he was waylaid delivering the letter to Romeo. Laurence runs off one way to the crypt, and we trudge another way, through doors and rooms, to the cellar where we have to wait some five minutes as the ushers cram the large number of patrons in on two sides of the room. It's a momentum killer. It's also unnecessary. Though the remains of black stone walls in this locale make for a spooky-looking mausoleum, one half of the old kitchen we just left has, unlike the rest of the ruins, a ceiling (the floor of a wood deck) and contains mounds of bricks that may once have been ovens or pantries. It's a sufficiently spooky crypt-looking space and would have required the audience to merely turn around between scenes. As well as the production otherwise uses its surroundings, the actors engaging the surrounding audience give this production its keynote charm. The settings incorporate the audience, as when Romeo uses a patron as a sample of a Veronese beauty. After Capulet (Dave Gamble) hands Peter (Robby Rose) the guest list for his party, we stroll with Peter to the next scene. As he can't read the guest list (because, according to the play, he can't read, period), Gamble's Peter borrows a woman's glasses to read the list, but with no success. He's also nibbling on a loaf of bread, and he offers some to the patrons. Lady Capulet (a statuesquely proper Kathryn Elizabeth Kelly) looks among the audience when she searches for Juliet, and as the Capulet party devolves from a formal Renaissance ball into a modern frat house kegger, cast members grab members of the audience to join in the dancing. Nurse (Kathryne Daniels), however, grabs Mercutio (Vince Eisenson), a moment that represents what's most right about this production. From a Shakespearean perspective, the portrayals of these two characters give this Romeo and Juliet its dramatic cred. The benchmark moment of Daniels' performance as Nurse comes after the party when Juliet (Elana Michelle) asks her to get the name of "he that follows there, that would not dance." Nurse departs through the audience, returns and says in a curt voice that mingles disappointment with warning: "His name is Romeo, and a Montague; the only son of your great enemy. Come on." That last impatient command is not textual, but it flows easily from Daniels' pitch-perfect command of Nurse's lines. Her longwinded tale of the toddler Juliet falling and bumping her head lands the bawdy joke so well it elicits laughter in its own right while her incessant repetition of it—as if she's feeding off the audience's delight in her telling—is both amusing and wearisome, exactly as it should be. Upon Mercutio sexually accosting her in the marketplace, Daniels fans her head, her breasts, and then lifts up her dress to fan herself underneath, saying, "I'm so vexed, every part about me quivers." It comes off as improvisational, but it's Shakespeare all the way. It also suggests a Nurse at the age of menopause. The directors and Daniels establish a credibly insightful moment when Lady Capulet informs Juliet of the girl's impending marriage with Paris. Michelle's Juliet instinctively looks to Nurse, who, behind Lady Capulet's back, gestures a warning to the girl to remain silent about being newly wed to Romeo. Juliet heeds the warning, but is not pleased with Nurse's later counsel to marry Paris anyway. However, this production cuts Juliet's subsequent cursing of Nurse after the latter's departure, perhaps for thematic reasons, probably for time constraints, but a sad choice nonetheless as it would have carried so much poignancy in the wake of Daniels' portrayal of Nurse. This play is famous for some of Shakespeare's most beautiful poetry, and Eisenson reminds us that Mercutio can speak as prettily as Romeo and as commandingly as Juliet. This combination gives incredible charge to his encounter with "the king of cats" Tybalt (Kelsey Painter) and even provides substance to his conjuration of Romeo who has given him and Benvolio the slip after Capulet's party—beautifully spoken verse even though Eisenson's Mercutio is drunker than a Jello shot–binging underclassman. By the way, in this post-party scene, Benvolio (a fun-loving Matthew Ancarrow) and Mercutio know exactly where Romeo is hiding (inside the Patapsco Institute kitchen's large fireplace), which provides the latter portion of this scene—starting with the conjuring—an entirely different reading than if Mercutio were merely braying in the night. Another unusual performance angle is Paris (James Vincent Murray) being noticeably abusive toward Juliet at Friar Laurence's cell, even in front of the friar. This Paris is a dangerous young man, a preening, spoiled scion. But then, so is Tybalt, and Mercutio, too, for that matter. As enticing as this portrayal of Paris may be, however, it makes little sense textually that he visit Juliet's grave in the night. At least Murray's Paris doesn't ask Romeo to lay his dying body next to Juliet—but that is because Romeo needs to drag Paris's body out of the room so that Murray can return in short order as Escalus, the exasperated Prince of Verona. 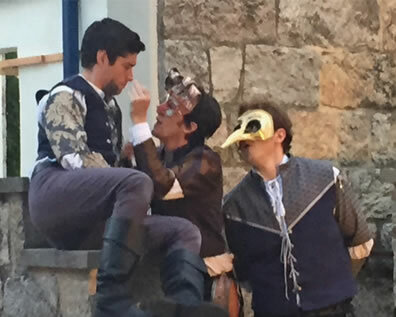 Mercutio (Vince Eisenson, center) describes Queen Mab to Romeo (Séamus Miller) as Benvolio (Matthew Ancarrow) listens intently in the Chesapeake Shakespeare Company's production of William Shakespeare's Romeo and Juliet at the Patapsco Female Institute Historic Park. In this movable production, scenes took place around the grounds of the remains of the 18th century girl's boarding school. Photo courtesy of Chesapeake Shakespeare Company. A more glaring misstep is Small and Keddell jumping on the bandwagon of directors combining two Shakespeare scenes into one. Rarely does this device improve the play, and usually it undermines Shakespeare's dramatic intentions. Small and Keddell apply this device in intersplicing the scene of Juliet learning from the Nurse of Romeo slaying Tybalt with the subsequent scene of Romeo learning from Friar Laurence of his banishment. The Royal Shakespeare Company did this in its 2011 production in New York, and my two-word reaction in my review was "upside, none." The downside is greater here, for not only does it undermine Shakespeare, it undermines Small's and Keddell's intentions with a movable production by forcing us to switch our attention from Romeo and Laurence down in the old kitchen to Juliet and Nurse up on the balcony. Keeping up with the transitions is too much physical effort. Furthermore, the actors continue in their hand-wringing (Juliet), body-wrenching (Romeo) consternation rather than settling into tableaux stillness when the scene shifts to the other pair of characters. This is the way to distract audience members from important matter being discussed below or above, depending on where you happen to be located. That last observation actually points to an upside of Michelle's portrayal of Juliet and Miller's of Romeo. Both bring youthful, naïve exuberance to their roles. Their romance may be puppy love ("You kiss by the book" is a cool thing for Michelle's Juliet), but have you ever seen a puppy in love? Such aching yearning a puppy displays in its desire for affection will steal your heart. It's understandable that Romeo and Juliet are so emotionally consumed by their affections it consumes their intellects, too. However, by relying almost entirely on physical manifestations of their ardor, Michelle and Miller don't wring the emotions out of the verse itself, tripping over rather than through their lines. Consequently, in this production, the greater passion belongs to Nurse, and the best poetry comes from Mercutio.